Owls are so trendy right now. I love it. I am also seeing lots of owls lately. Everywhere! I know it is a long way away (hopefully!) But isn't this owl/woodland theme boy's room just to die for?! Head on over to The Daily B to enter! Owls have a special place in my heart. Far before they were the new "it" accessory, my grandmother collected all things owl. She had them scattered around her house for as long as I can remember. One year for her birthday I think I found a little ceramic owl at Anthropologie and gave it to her; to augment her impressive collection. I don't really know why she loves owls so much. That's a good question to ask her! She has been collecting owls for a long, long time. And every time I see an owl I think of her; of my fondest memories with her. Like picking berries in the summer's afternoon heat- and cursing the birds who got there first. We'd pick them while Gram sat under the shade of the porch with a big turquoise strainer. After all the berries were picked, she'd wash them up and we'd stuff ourselves silly. I buy berries at the grocery store just because I think of her when I bite into one. My grandmother has changed over the years. Her memory is failing. Watching a villanous disease take its toll, robbing her of her mind, is heartbreaking. She gets confused easily, and usually can't remember events from ten minutes prior. I know that isn't my grandmother. Not really. My grandmother is a firecracker! A vibrant woman who would take us to Art in the Park each year. Who bought special sugary kids' cereal for our sleepovers at her house. Who made THE MOST amazing Thanksgiving stuffing I have ever had the privilege to wolf down. She attended every play, every ballet and piano recital of my youth. She is always in the fabric of my life. I wish my kids could know the woman I knew. The woman who was such an amazing beauty- the very hallmark for aging gracefully. I remember even as a small child, my Grandmother always had an impeccable appearance. I would oftentimes watch her apply her makeup at the kitchen bar with her magnifying mirror, getting everything just right. I even use her secret for lovely, flawless skin, Sea Breeze astringent. She got compliments everywhere she went on her perfect alabaster complexion. She always said it was the Sea Breeze. The little bottle you can pick up for around a dollar at most drug stores. I will always dab on the Sea Breeze- because she said so. I still take my children to see her, they love to visit "Grandmama." (while she is a great grandmother in every sense of the word, she prefers the more refined Grandmama title) Every time we walk in, her face lights up. I know it is oftentimes hard for her to gather the strength, but she always puts on a big smile for my girls. And always a kiss for Little Man. I treasure every moment I have with her. Even if it isn't the same. Even if I leave and she doesn't remember our visit. I remember it for us. 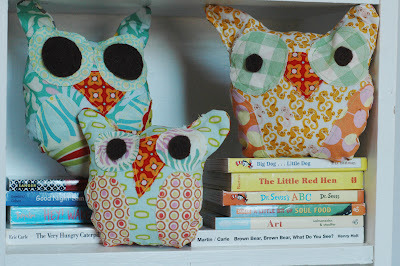 And I will always keep owls around my house. Maybe I'll even collect them. If for no other reason than they remind me of her, and I enjoy that warm, fuzzy feeling. I love your grandma. She's such a wonderful woman. I'm so sorry you have to see her going through this hard time. I can't imagine your pain and that of your parents. I think about you guys a lot, I hope all is well. Miss you! Oh Ashley, what beautiful and loving words for wonderful Grandma Jones!!! When I think of her I always remember her infectious smile!! !